Walter Wellman, whom I imagine to be a bit like Peter Parker’s boss in Spiderman. 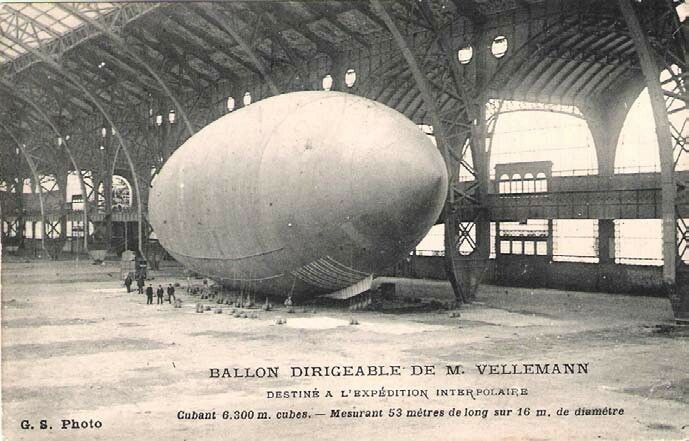 My first two blog posts about airships both came to rather tragic conclusions, so I’m relieved to say that this one merely ends in dramatic failure and a lucrative book deal. The second aerial attempt on the North Pole was made by American newspaperman and part-time adventurer, Walter Wellman. 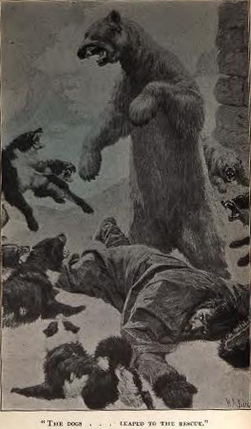 Not content to simply write about events, in the 1890s Wellman took to filling slow news weeks with his attempts to trek to the North Pole on foot, which always ended in heroic failure (usually involving fist fights with polar bears). 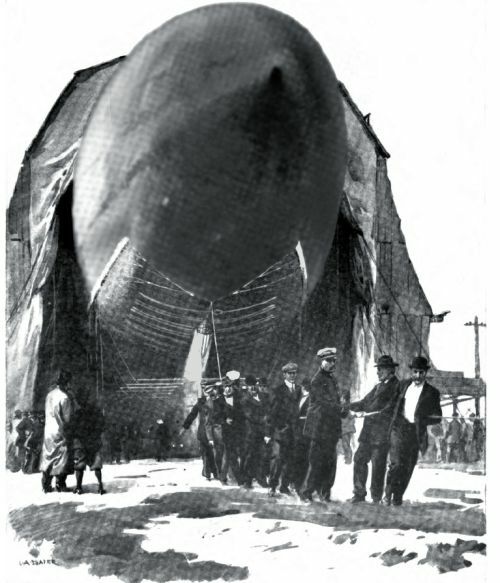 Inspired by the extreme tediousness and discomfort of pedestrian Arctic exploration, in 1906 Wellman turned to airships as a means of avoiding further months spent eating seal blubber and Bovril. America: looks like a lemon. Since the expedition was financed by the Chicago Record-Herald, many at first dismissed Wellman’s efforts as an advertising stunt. If this was the case, then he went to considerable cost and bother trying to make his advertising stunt reach the newspaper readers of the North Pole. His airship, named the America, was built for him in France with guidance from Santos-Dumont and several French aeronauts. At 6,300 cubic metres, it was the second largest balloon in the world at the time (after Count Zeppelin’s), and constructed from three layers of fabric and three of rubber glued together to give extra leak protection. The America, with its “sausage” slung underneath ready for deployment. It also sported a novel device, which Wellman called the “equilibrator” (or affectionately, his “stuffed serpent” or “sausage”). The equilibrator was a long leather tube, clad in steel “scales” and packed with reserve food. It was designed to drag along the ice/sea and automatically regulate the ship’s height without the need for tossing out ballast or venting gas: if the ship descended, more of the equilibrator’s weight would be on the ice, lightening the ship and causing it to rise; if the ship rose, more of the equilibrator’s weight would be carried by the ship, causing it to descend. Like most serpents however, it caused endless trouble, which ultimately led to a fall. 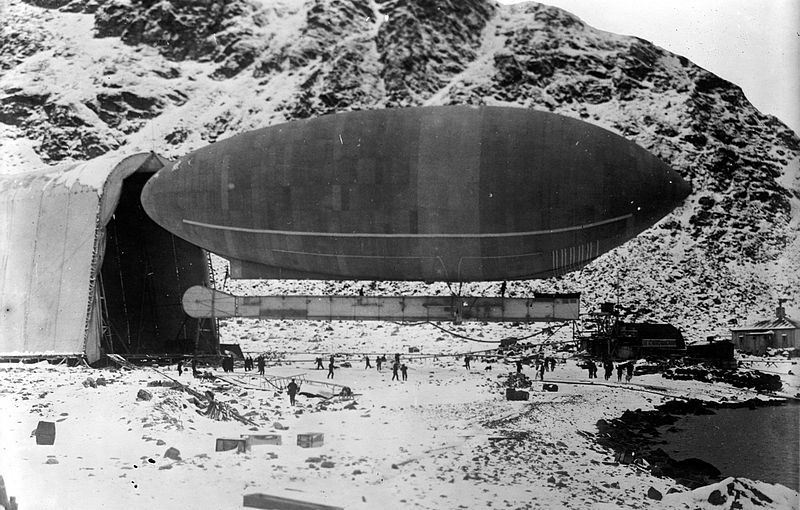 Wellman shipped out to Spitzbergen in 1906 and built “Camp Wellman”, heartlessly demolishing Andree‘s ruined balloon house for timber. Not being a subscriber to the suicidal polar explorer club, Wellman stocked the America with 10 months’ food for the three-man crew, sledges and 10 emergency huskies. Delayed by bad weather, the America finally took flight in September 1907, rather late in the adventuring season. The ship travelled a disappointing 35 miles before being forced down onto a glacier by a snowstorm, leaving Wellman to be rescued by sailors. America being rescued by the steamer, Farm. After taking a break to report on the US elections, Wellman returned to Spitzbergen in 1909 with an enlarged America, determined to try again. The second attempt started promisingly, until 65 miles in when the equilibrator embarrassingly fell off. This caused the ship to soar up to 1500m, from where it could only be brought down again by venting hydrogen. 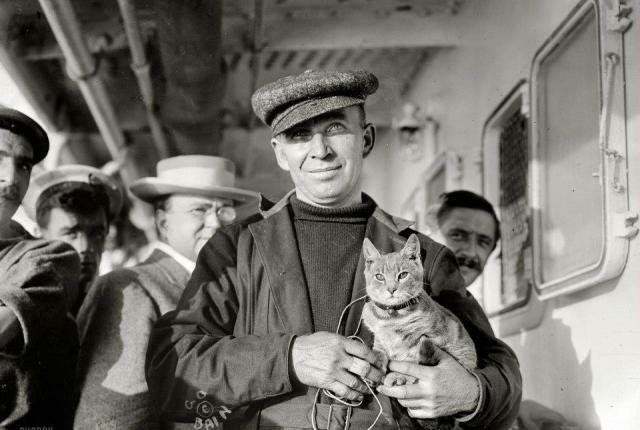 Wellman was rescued again, this time by Norwegian sailors, who towed the America, her disappointed crew and terrified dogs back to Spitzbergen. Contrary to the opinions of most, Mr Wellman felt that, “but for the accident to the auxiliary device, the equilibrator… the America might easily have reached the Pole or its vicinity in from 25 to 30 hours.” Wellman vowed to return in 1910 with an even bigger America. Peary: pioneer of animal onsies. However, it was at about this time that people started claiming they had already got to the Pole using sledges and Inuits. 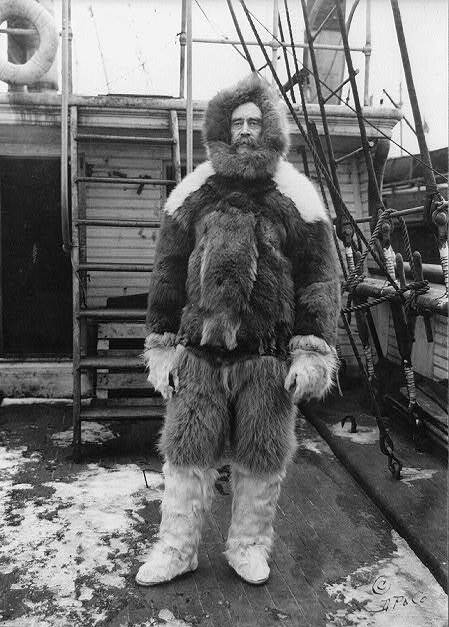 Believing that Robert Peary (or possibly Frederick Cook) had already thoroughly discovered the North Pole, Wellman decided that the Arctic was old news. The America leaving the hangar in Atlantic City. 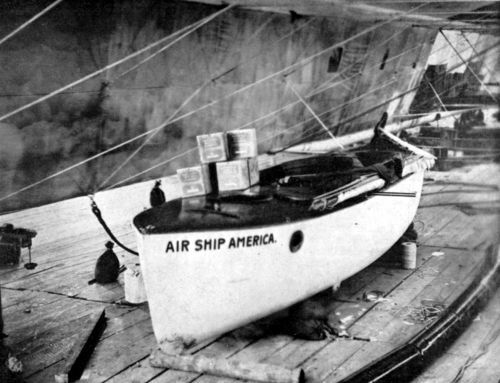 Despite her longest flight having been only 65 miles, Wellman was confident that, with a few adjustments, the America could make the 3,500 mile trip across the Atlantic. With the financial assistance of the London Daily Telegraph, the New York Times and the Chicago Record-Herald, Wellman had the America enlarged again and fitted out with a new car, new engines, a radio and a new equilibrator (this time composed of gasoline cans attached to a 300 foot steel cable). Demonstrating once more his keen survival instincts, Wellman also had a sturdy mahogany lifeboat (which doubled as the ship’s look-out post and smoking room) slung under the keel. The America’s lifeboat, built on the Isle of White by Saunders of Cowes, weighed twice as much as expected. All this extra safety came at a price however, and the airship came in sadly overweight. 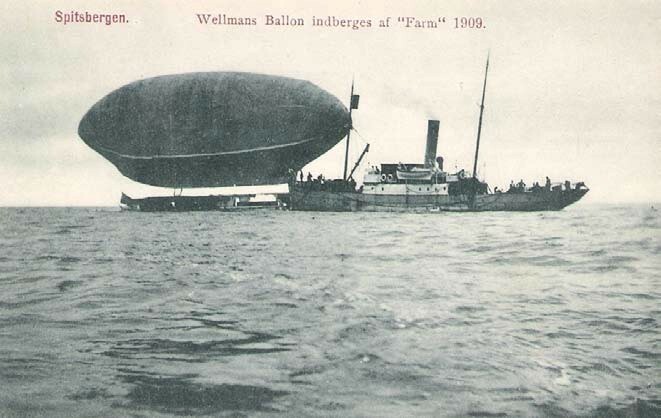 Wellman’s view (which hopefully his crew bought into) was that, “…duty at times compels a man to take an imperfect apparatus, and… go out with it and do the best he can, no matter at what cost or risk.” Thus the America set off from a fog-bound Atlantic City in October 1910 dragging her submerged equilibrator through the sea. The lovely Kiddo, with chief engineer, Vaniman. The most famous member of Wellman’s crew (thanks to the internet being run by cats) is now Kiddo: a grey tabby brought along as a mascot. His main contribution to the voyage was to keep everyone awake: initially by his terrified yowling during the early stages of the voyage and later by his habit of trying to sleep on people’s faces. Almost from the start of the voyage, the America ran into trouble. One of her two engines refused to run at all; the other had the delightful habit of shooting burning matter from its exhaust, the sparks skittering playfully across the underside of the hydrogen-filled balloon. Wellman calculated their chances of being blown up at 50:50. America failing to cross the Atlantic. With a great deal of effort, the America managed to avoid the embarrassment of being shipwrecked on the luxury coast of New England, however the crew was soon reduced to jettisoning necessary fuel, supplies and the broken engine in order to maintain altitude. In rough seas, the 2-tonne equilibrator bounced from wave to wave, tugging the balloon down each time so that it nearly hit the water. After drifting powerless through the third day, by shear luck, they made contact with the Royal Mail steamer, Trent. The America‘s crew got into their lifeboat and cut it loose from the balloon. Freed from the tedious weight of Wellman’s ambitions, the America rose and continued on her merry way, though the equilibrator couldn’t resist having one last go at killing them all as it departed. Fortunately, the large hole it made in the lifeboat was above the waterline. The only person disappointed was F Murray Simon, the British navigator. Since his favourite sport was boating, he had been perversely looking forward to spending a few days on the mid-Atlantic in an open boat. The crew of the Airship America returned to a hero’s welcome. 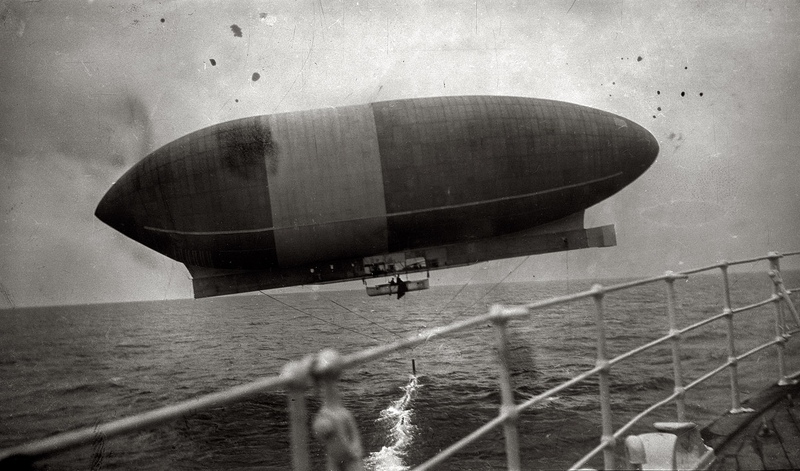 They failed to cross the Atlantic, but did set a new airship distance record of 1,008 miles. Kiddo was much fêted and later displayed in a gilded cage in the window of Gimbels department store, before going into retirement. Illustration from Wellman’s book about himself. Walter Wellman was quite clearly a publicity-hungry arse. Though he liked to say a lot about advancing science and human progress, he didn’t really do any science on any of his trips, preferring to gawp at the scenery and write self-aggrandising journals. 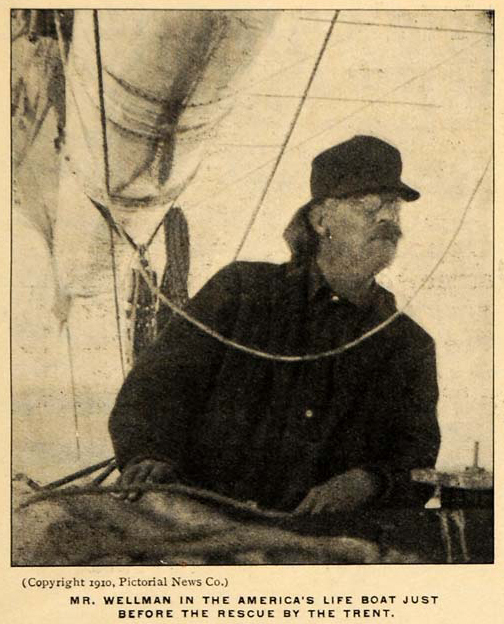 His goals of “reaching the pole” or “crossing the Atlantic” were mainly chosen because they made good headlines. If Wellman had been serious about advancing aviation, he would have slowly developed a practical and reliable ship through – I don’t know – perhaps some test flights or something. Instead he sailed off in needlessly dramatic, all-or-nothing haste in untried ships. His main contribution to aviation was to prove that equilibrators are stupid. Great post! I’ve never heard of Wellman or his cat before. Looking forward to the next post. It’s amazing how unfamous some people become considering how famous they were before. I suppose Wellman was a bit of an “also ran” in the exploration stakes. My next airships pioneers are more well-known.